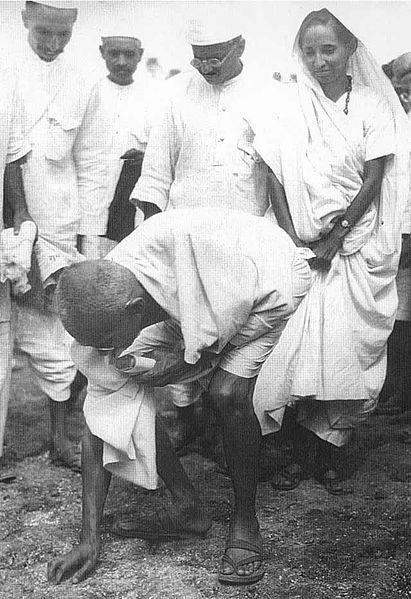 On March 12, 1930, Mohandas Karamchand Gandhi began the Salt March. Along with a few followers, he set out from Sabarmati and walked to the coastal village of Dandi. A journey of nearly 400 kilometers lasting 23 days. He had decided to make the Salt Tax imposed by the British as a focal point of nonviolent political arrest. The British monopoly on the salt trade in India dictated that the sale or production of salt by anyone but the British government was a criminal offense. On reaching the coast he picked up a clump of mud and salt and said, “With this, I am shaking the foundations of the British Empire.” He then boiled it in seawater to make the salt which no Indian could legally produce. Inspired by Gandhi’s salt march, a social enterprise called SABRAS, seeks to create a second salt march, attempting to bring dignity to the impoverished salt workers of the Kutch region. Between 70-75% of India’s salt comes from the state of Gujarat. Little Rann of Kutch is famous for its unique salt-pans where salt is harvested by tribes called Agariyas. Producing salt is highly labour intensive, requiring water to be pumped out of the ground to create salt lakes that require constant raking to form crystals. Workers incur the highest costs when they borrow money to buy diesel to pump water into the salt lakes. Since Agariyas have to go deep inside the desert to get salt, the nearest village is 25-35 km far. Agariyas can bath only once in 8-10 days leading to health ailments. For last two years government tankers have stopped supplying water forcing the families to spend as much as Rs 2000 a month to procure water from private operators. Agariyas work relentlessly in severe heat conditions (nearly 50 degree Centigrade temperatures ) without any protective gear to protect their feet from absorbing too much salt. The condition is so serious that upon cremation, while rest of the body burns naturally, the feet stay undestroyed to the high levels of salt. Around 50,000 Agariyas ‘cultivate’ salt every year. Often the Agariyas are engulfed in huge debts at the hands of traders and middlemen. “Since they do not have cash and access to institutional credit, they have to borrow money from traders who provide credit, with the condition that the price of salt is fixed at 100 rupees/1,000kg. The market cost of processed salt is substantially more at 14,000/1,000kg,” says Rajesh Shah, 62, an entrepreneur who established a social enterprise company called Sabras in 2007 with the aim of increasing profits for small-scale producers. SABRAS uses commerce to improve the lives of the Agariyas by (1) committing to fair trade practices, (2) offering innovative solar powered water pumps through a lease to own financing program and (3) providing salt workers the opportunity to become owners in SABRAS; all of which increase the overall profitability and productivity of the salt workers. In July this year, a massive shutdown due to failure in India’s northern and eastern power grid left millions in dark. However, in one tiny village ‘Khareda Lakshmipura’ close to Todaraisingh Mandal in Tonk district of Rajasthan , the lights stayed on, thanks to “Gram Power”. Gram Power provides ultra-affordable and reliable electricity to the energy-deficient population by producing and storing renewable energy. Gram Power generates power from various sources – solar, wind, and biomass (all of which are abundantly available). The power is stored in batteries and distributed to consumers using a ‘smart micro grid’. A local entrepreneur purchases bulk energy credit from Gram Power and then sells it to the locals using Gram Power‘s prepaid energy selling device. Apart from generating grassroots employment, this makes power affordable, allowing consumers to use their disposable incomes to purchase power. DC transmission technology to prevent theft. Now, at least 10 villages have been electrified using this technology in Rajasthan. Families in these villages no longer have to rely on kerosene, which releases pollution and causes household fires, nor do they have to pay a runner to charge their phone. Yashraj Khaitan, the co-founder said their smart grid site is the only village in the entire area receiving reliable power on demand round the clock. According to him, this benefit should be compared with villagers shelling out Rs 10 for a one-time recharge of their cellphone from a neighbouring electrified village. Gram Power ‘core innovation’ is in grid monitoring, theft detection and a prepayment model that ensures payment recovery. They are looking for partnerships to increase access to this technology through state and central agencies. With the advent of modern equipments and practices across the world, farming has become an industry. Small farmers have been routed by large corporate houses. And in rare cases where small farmers do exist, they are exposed to fierce competition, resulting in low productivity and poverty, prompting them to migrate to towns and cities. Though the constant conflicts played out in the news obscure Palestine’s ancient and rich farming tradition, they have been able to flourish, thanks to Canaan. Canaan is a mission based Palestinian fair trade company that seeks to empower small and marginalized Palestinian producer communities caught in the midst of conflict through organic agricultural production and fair trade. some $100,000 to start a company he called Canaan Fair Trade. The son of a watermelon farmer, he offered growers nearly twice the going rate during the olive harvest that year and soon started shipping oil to the U.S. and Europe. The company today works with more than 1,500 farmers in 43 villages. Mr. Abufarha helped create farmer cooperatives and network the co-ops to address quality issues. By working together, farmers benefit from collective pressing that allows them to press smaller yields on a daily basis, resulting in higher quality oil. They are also able to maintain traditional farming techniques, with minimal use of machinery, ensuring that the land retains its quality for future generations. Along with Olive Oil, the farmers at Canaan also produce honey, tahini, couscous, and Za’ atar. Canaan is an excellent example of how fair trade can help disadvantaged farmers and their families rebuild their lives and communities around their land. M Nageshwar, 37, is a software engineer who worked with a company for 10 years before he was found guilty of killing his wife and sentenced to life. Thanks to a unique program at the Cherrapally jail, he is leading a group of convicts who are training to work at a unique Business Process Outsourcing(BPO) unit. Cherlapally jail is located on the outskirts of Hyderabad city in Andhra Pradesh. A conference room in the jail has been converted into a computer room where nearly a dozen prisoners are being trained to perform jobs such as data processing and data entry. It will specialise in non-voice based, off-line outsourcing work like digitising records, legal documents, scripts, manuscripts and text books, and medical transcription, says K Mohan Menon, a manager with Radiant Info Systems, a Bangalore-based company which is assisting the venture as part of its Corporate Social Responsibility (CSR). Typically, the convicts would be paid 15 rupees [33 cents] per day for work like making steel furniture or working on looms in the prison, but authorities expect to pay them 100 rupees [$2.2] to 150 rupees [$3.32] a day for working in the BPO unit. Mr. Nageshwar has contested his case in the Supreme Court. “I am excited about the project. Educated people like me can easily slip into depression when they are incarcerated. It is a relief for convicts like me and a good opportunity to prove ourselves,” he says. Other inmates of the prison hope that this project would enable them to integrate into the mainstream after completion of their jail term. Anegundi is a small village in Gangavathi Taluk, Koppal district of Karnataka, located on the banks of the river Tungabhadra. The picturesque village has an illustrious past. It is believed to be the ancient place known as Kishkindha, the legendary kingdom of Vali and Sugreeva, and the birthplace of Hanuman, the devotee of Lord Rama in the epic Ramayana. Historically, this place is associated with various kingdoms that ruled southern India, including the Kadamba, Chalukya, and Vijaynagar empires. Until few years back, most of the villagers were entrenched in poverty, and the archeological site was in a dilapidated state. Anegundi, which is within the vicinity of the Hampi UNESCO World Heritage Site, has benefited from the UN program, in coordination with The Kishkinda Trust. The Kishkinda Trust was established in 1997 by Ms. Shama Pawar, to integrate heritage conservation with the lives of the people and towards the socio-economic and cultural enhancement of Anegundi. Their programs combine heritage conservation with crafts, rural tourism, and organic farming. You can see the work of The Kishkinda Trust in the video above. Anegundi is an example of eco-tourism which improves livelihoods of locals while conserving the archeological and cultural diversity of the place. The mythical story of Salsal and Shahmama is embedded in the history and culture of the Bamiyan people in Afghanistan for generations. It is believed that these Buddha statues symbolized the ancestry of the Bamyan people. The 55 metre high statue was known as Salsal whereas the 38 metre high statue was known as Shahmama. In 2000, when the Taliban demolished the statues, they wiped out the art, history, and an important identity of the Bamiyan people. Decades of war and unrest in Afghanistan has resulted in a myriad of social ills. The war has cost the Afghan people their freedom, education, health, and culture. Amidst this turmoil, is a brave initiative aimed at revitalizing the lost culture. 24 year old Monireh Hashemi established the Simorgh Film Association of Culture and Art (SFACA) in Kabul. Earlier this year at the First South Asian Women’s Theatre Festival in Delhi, she and her theatre troupe staged ‘Salsal and Shahmama’ – a play performed in Dari, based on the story of two sisters living near a Buddha statue of Bamyan. Through the course of the play, the sisters find themselves witnessing the explosion and destruction of the statues. The 75 minute play includes forgotten songs and dances that were part of the culture. Salsal and Shahmama is one of the few plays staged by this troupe. Various themes depicting mythology, and also reflecting today’s social problems are enacted by the troupe. At a time when women in Afghanistan are not permitted to leave their homes, a woman performing in theater is bound to risk her life. Monireh Hashemi is a young, Afghan girl who writes, directs, and acts in plays – a rarity in Afghanistan. She and her troupe defy family members and religious leaders to perform the plays. They continue to receive threatening anonymous phone calls. Mindful of the threats, they believe in a few concessions. In keeping with the tradition, actresses on stage always have their heads covered. Impacts of violence is felt by everyone, and according to Monireh Hashemi, more so by women. After decades of turmoil, Afghan art and culture is hesitantly on the revival path. And at the center of it are individuals who risk their lives to preserve the country’s historic culture. Films are a source of entertainment. We learn from them, enjoy them, and relate the fantasy on screen to our own lives. These cultural artifacts reflect our culture, beliefs, and provide joy and relaxation. In the past decades, Mexico has witnessed many small cinema houses go out of business or converted into multiplexes. This trend in turn has led to soaring ticket prices as high as US $4.50 (close to INR 250). While this is affordable for the middle-class and the elite, for 90% of the Mexican population who earn less than US $300 per month (close to INR 1500), this is a luxury they cannot afford. Ariel Zylbersztejn, a young film-maker, came up with a unique model to screen free movies without relying on donations to sustain operations. He founded Cinepop. Cinepop provides free access to family movies for the urban and rural poor in Mexico. “We give massive movies shows on gigantic inflatable screens totally free, in places where the average family income is approximately $300 a month. On weekend evenings, we project family films in central spots of the city for about 5,000 people,” exclaims Cinepop’s founder Ariel Zylbersztejn. Cinepop shows more than one film a week in Mexico, reaching upwards of 350,000 people a year. The showings are occasions to promote social programs, like free or low-cost medical consultations and education on self-employment. Zylbersztejn has changed the ‘pay-for entertainment’ paradigm by creating a win-win situation for all stakeholders involved. The local government provides a spot for Cinepop to host its massive screening events. They also provide venue facilities, and transport. Prior to film showings, Cinepop offers an opportunity for sponsors to carry out promotional activities and public service messages to an audience otherwise inaccessible. Sponsors include microfinance organizations, low-cost medical clinics, housing projects, and education organizations. Cinepop does have a huge responsibility towards its audience. They need to be cautious of whom they partner with for sponsorship and what message is provided to the people. They have expansion plans and would like to replicate the model in developing countries such as India and China. These days we hear a lot about ‘green’ energy, and ‘renewable’ sources such as wind power and solar power. How about generating power using dirt? That is exactly what Lebone Solutions, does. They are a social enterprise that generate power using dirt. Lebone translates to ‘light stick’ in the Banthu language Sotho dialect, spoken in some southern African nations. The soil isn’t really turned into electricity per say, instead an anode and cathode are placed in the ground. Dirt is then placed on top of the anode and cathode and this is all connected to circuit board that charges a battery. The battery is charged and is then strong enough to provide a few hours of lighting. “A cubic metre of organic matter will generate only enough energy to light one high-efficiency LED light”. To charge the battery activity from soil, microbes (bacteria or fungi) break down organic matter generating electricity. India has a large population of deaf people. It is very unfortunate that in India, not only do you have to cope with your daily struggle, you are also shackled by the clutches of social stigma widespread in India. By founding Mirakle Couriers, Dhruv Lakra is economically empowering these people. Mirakle Couriers employs only deaf people. All the staff members including delivery personnel are deaf. The company’s business model is based on creating a service driven profitable enterprise that uses the deaf. To this end, they marry professional excellence with social cause. Mirakle Couriers is not a non-profit or a charity. They are a social enterprise. He faced a lot of challenges, most importantly the attitude’s of his employee’s families. While some are proud, most are over-protective about their children, especially girls. Deliveries are done by boys, while sorting, accounting and other back-end work are done by girls. Girls do not go for deliveries only because they would be more vulnerable to abuse and bias, says Lakra. He also spent a lot of time on the job helping to fine-tune the process of courier delivery. His 15-member team devised signs to communicate possibly everything we would deem mundane. Names of places: Wavy hands indicate Chowpatty or Charni Road, Vile Parle is indicated by a biscuit-bite gesture. Dhruv ensures he is in touch with all of his boys on the field. SMS is our lifeline at times, he says. There is so much we do not know about people a little different from us. We need to embed a sensitive chip into our thought process. Future plans for Mirakle Couriers include expanding their operations beyond Mumbai.